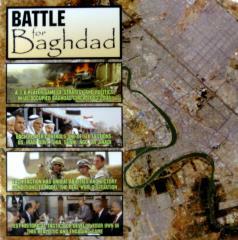 Battle for Baghdad is a unique multi-player game in which players represent different factions vying for control of the governance of Iraq during US occupation. The game emphasizes the roles and capabilities of the various factions involved, and demonstrates how asymmetric capabilities can be leveraged to generate favorable outcomes. The playing surface is constructed from satellite images of the city of Baghdad and each component is carefully researched for authenticity. For three to seven players, the board game is of moderate complexity. The Rule Book will contain research, designer, and developer’s notes as well as a complete game replay, playtest game outcomes, situation article, and game design discussion.